Have you guys heard The Donnas or maybe that dog.? Or something kinda in between those two? Well Bat Boy draws heavily from the Weezer-era method of sorta 50's pop ballads over rock beats on their first track, Giantess. They keep cruising right in that vein through the rest of side A and keep it straightforward and nice. 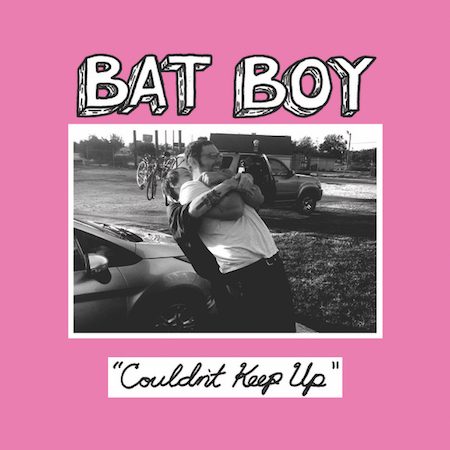 It's a solid slice of power pop and I bet Bat Boy would be a spectacularly fun live band. Side B continues the same jams. Maybe it's more 70's, actually. It feels like it would be appropriate to play these songs over some film of teens in flared jeans standing outside a bowling alley trying to grow mustaches or scam alcohol. I'd definitely play this in a Camaro. The last track screams out the Carrie Akre project Goodness, which you'll have to dig pretty deep to find, but it's a solid late-nineties sound that capitalized on the mid-nineties punk explosion in a radio-palatable major label way. As a nostalgic effort, this is a decent record. It's probably not going on my steady rotation, but it's well crafted and folks born after 2000 will find sounds and melodies that will interest them, for sure.